Enter off Forest Track and turn left onto Tea Tree Road. Head North onto the Western Track which turns to the east to the Gentle Annie Track. The most difficult parts of the track are on Gentle Annie. 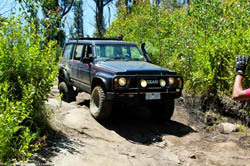 The track goes into an intersection and either Forest Road or Tea Tea Track lead back out. Done this from lift Patrol. It was nothing for that. And also standard Patrol without lift. It was bit difficult for that. Specially rock area. Need some attention. But can do in dry. In wet could be very slippy and difficult.